central cord syndrome injury to the central portion of the cervical spinal cord resulting in disproportionately more weakness or paralysis in the upper extremities than in the lower; pathological change is caused by hemorrhage or edema. Central cord syndrome. From Ignatavicius and Workman, 2002.
central fever sustained fever resulting from damage to the thermoregulatory centers of the hypothalamus. central nervous system the portion of the nervous system consisting of the brain and spinal cord. See also Plate 14.
central venous catheterization insertion of an indwelling catheter into a central vein for administering fluid and medications and for measuring central venous pressure. The most common sites of insertion are the jugular and subclavian veins; however, such large peripheral veins as the saphenous and femoral veins can be used in an emergency even though they offer some disadvantages. The procedure is performed under sterile conditions and placement of the catheter is verified by x-rays before fluids are administered or central venous pressure measurements are made. Selection of a large central vein in preference to a smaller peripheral vein for the administration of therapeutic agents is based on the nature and amount of fluid to be injected. Central veins are able to accommodate large amounts of fluid when shock or hemorrhage demands rapid replacement. The larger veins are less susceptible to irritation from caustic drugs and from hypertonic nutrient solutions administered during parenteral nutrition. Patient Care. Patients who have central venous lines are subject to a variety of complications. Air embolism is most likely to occur at the time a newly inserted catheter is connected to the intravenous tubing. Introduction of air into the system can be avoided by having the patient hold his breath and contract the abdominal muscles while the catheter and tubing are being connected. This maneuver increases intrathoracic pressure; if the patient is not able to cooperate, the connection should be made at the end of exhalation. Sepsis is a potential complication of any intravenous therapy. It is especially dangerous for patients with central venous lines because they are seriously ill and less able to ward off infections. Careful cleansing of the insertion site, sterile technique during insertion, periodic changing of tubing and catheter, and firmly anchoring the catheter to prevent movement and irritation are all essential for the prevention of sepsis. Formation of a clot at the tip of the catheter is indicated if the rate of flow of intravenous fluids decreases measurably or if there is no fluctuation of fluid in the fluid column. Preventive measures include maintaining a constant flow of intravenous fluids by IV pump or controller, periodic flushing of the catheter, heparin as prescribed, and looping and securing the catheter carefully to avoid kinks that impede the flow of fluids. Cardiac arrhythmias can occur if the tip of the catheter comes into contact with the atrial or ventricular wall. Changing the patient's position may eliminate the problem, but if ectopic rhythm persists, additional interventions are warranted. central venous pressure (CVP) the pressure of blood in the right atrium. Measurement of central venous pressure is made possible by the insertion of a catheter through the median cubital vein to the superior vena cava. The distal end of the catheter is attached to a manometer (or transducer and monitor) on which can be read the amount of pressure being exerted by the blood inside the right atrium or the vena cava. The manometer is positioned at the bedside so that the zero point is at the level of the right atrium. Each time the patient's position is changed the zero point on the manometer must be reset. For a multilumen catheter the distal port is used to measure central venous pressure; for a pulmonary artery catheter the proximal port is used. An arterial line can also be used to monitor the central venous pressure. The waveform for a tracing of the pressure reflects contraction of the right atrium and the concurrent effect of the ventricles and surrounding major vessels. It consists of a, c, and v ascending (or positive) waves and x and y descending (or negative) waves. Since systolic atrial pressure (a) and diastolic (v) pressure are almost the same, the reading is taken as an average or mean of the two. The normal range for CVP is 0 to 5 mm H2O. A reading of 15 to 20 mm usually indicates inability of the right atrium to accommodate the current blood volume. However, the trend of response to rapid administration of fluid is more significant than the specific level of pressure. Normally the right heart can circulate additional fluids without an increase in central venous pressure. If the pressure is elevated in response to rapid administration of a small amount of fluid, there is indication that the patient is hypervolemic in relation to the pumping action of the right heart. Thus, CVP is used as a guide to the safe administration of replacement fluids intravenously, particularly in patients who are subject to pulmonary edema. Central venous pressure indirectly indicates the efficiency of the heart's pumping action; however, pulmonary artery pressure is more accurate for this purpose. A high venous pressure may indicate congestive heart failure, hypervolemia, cardiac tamponade in which the heart is unable to fill, or vasoconstriction, which affects the heart's ability to empty its chambers. Conversely, a low venous pressure indicates hypovolemia and possibly a need to increase fluid intake. one of the two main divisions of the nervous system, consisting of the brain and the spinal cord. The central nervous system processes information to and from the peripheral nervous system and is the main network of coordination and control for the entire body. The brain controls many functions and sensations, such as sleep, sexual activity, muscular movement, hunger, thirst, memory, and emotions. 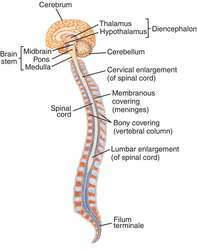 The spinal cord extends various types of nerve fibers from the brain and acts as a switching and relay terminal for the peripheral nervous system. The 12 pairs of cranial nerves emerge directly from the brain. Sensory nerves and motor nerves of the peripheral system leave the spinal cord separately between the vertebrae but unite to form 31 pairs of spinal nerves containing sensory fibers and motor fibers. More than 10 billion neurons constitute but one tenth of the brain cells; the other cells consist of neuroglia that support the neurons. The neurons and the neuroglia form the soft, jellylike substance of the brain, which is supported and protected by the skull. The brain and the spinal cord are composed of gray matter and white matter. The gray matter primarily contains nerve cells and associated processes; the white matter consists predominantly of bundles of myelinated nerve fibers. Compare peripheral nervous system. See also brain, spinal cord. The brain and its downward continuation, the spinal cord, which lies in the spinal canal within the spine (vertebral column). The central nervous system is entirely encased in bone and is contrasted with the peripheral nervous system, which consists of the 12 pairs of cranial nerves arising directly from the brain, the 31 pairs of spinal nerves running out of the spinal cord, and the AUTONOMIC NERVOUS SYSTEM. the main mass of nervous material lying between the EFFECTOR and the RECEPTOR organs, coordinating the nervous impulses between the receptor and effector. The CNS is present in vertebrates as a dorsal tube which is modified anteriorly as the BRAIN and posteriorly as the SPINAL CORD; these are enclosed in the skull and backbone respectively. In invertebrates the CNS often consists of a few large cords of nervous tissue associated with enlargements called ganglia (see GANGLION). In some forms, i.e. 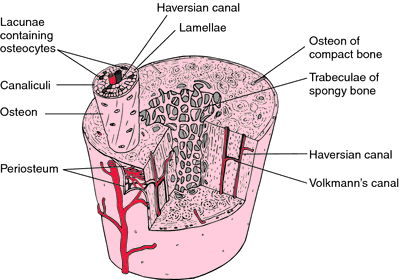 COELENTERATES, the place of the CNS is taken by a diffuse nerve net. In addition to relaying messages for the sense organs, (in higher organisms at least) the CNS takes on an additional activity of its own in the form of memory which is the storage of past experiences. See also AUTONOMIC NERVOUS SYSTEM. Part of the nervous system consisting of the brain, cranial nerves and spinal cord. The brain is the center of higher processes, such as thought and emotion and is responsible for the coordination and control of bodily activities and the interpretation of information from the senses. The cranial nerves and spinal cord link the brain to the peripheral nervous system, that is the nerves present in the rest of body. 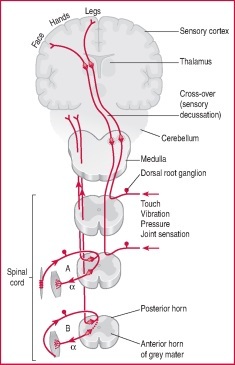 Figure 1: Ascending nerve pathways and proprioceptive reflex arcs, represented in diagrammatic sections of the brain and spinal cord. Shown on the right: those serving the sensations listed. Shown on the left: reflex pathways for skeletal muscle control. (A) From a muscle spindle, to a synapse with an alpha motor neuron, and a branch to the brain. (B) From a tendon organ, inhibitory branch (broken line) to an alpha motor neuron, and a branch to the brain. the brain and the spinal cord. 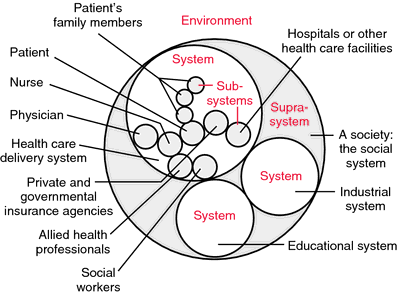 See also autonomic nervous system, peripheral nervous system; Figure 1. 1. pertaining to a nerve or nerves. in contrast to the more common form of this disease of cattle, the wasting form, this one is manifested by delirious signs of circling, head pushing, leaning, straddling, forceful licking including themselves, salivation and incoordination. There is a strong acetonuria and odor on the breath. the branch of the nervous system that works without conscious control. The voluntary nervous system governs the striated or skeletal muscles, whereas the autonomic governs the glands, the cardiac muscle, and the smooth muscles, such as those of the digestive system, the respiratory system and the skin. The autonomic nervous system is divided into two subsidiary systems, the sympathetic system and the parasympathetic system. It is also divided into central and peripheral sections. The core of the central section is the hypothalamus which receives afferent input from many other parts of the brain including the cerebral cortex. Its efferent output goes to many lower centers in the nervous system that have visceral control as their functions, e.g. the respiratory center in the medulla. The peripheral section consists of nonmedullated nerve fibers that leave the central nervous system in the craniosacral outflow (parasympathetic system) or the thoracolumbar outflow (sympathetic) system, and terminate in effector organs after passing through a ganglion, visible paravertebral ganglia in the sympathetic system, or ganglia embedded in the wall of the target organ in the parasympathetic system. the portion of the nervous system consisting of the brain and spinal cord. See also nervous, brain, cerebral. can occur in any of four ways: (1) Excitation or irritation, an increase in the number of electrical stimuli or facilitation in their passage. (2) Release phenomena, from the damping, modifying effects of higher centers; includes spasticity, exaggerated tendon jerks. 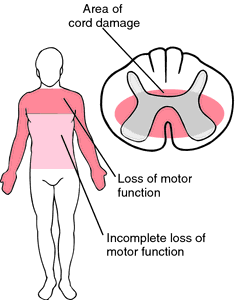 (3) paralysis, due to reduction or cessation of transmission of nerve impulses. (4) Nervous shock, a temporary cessation of activity in the nervous system as a whole in response to an insult applied to a part of it. the portion of the nervous system consisting of the nerves and ganglia outside the brain and spinal cord. the organ system that along with the endocrine system, correlates the adjustments and reactions of an organism to internal and environmental conditions, comprising the central, peripheral and autonomic nervous systems. Q. Fibromyalgia deeply affect the CNS? Do fibromyalgia deeply affect the CNS (central nervous system)? A. Fibromyalgia is somewhat related to central nervous system. Fibromyalgia can ultimately disrupt the flow of neurotransmitters between the body and the brain. As a result, fibromyalgia can cause the patient to feel continuous pain, and create chronic muscle spasms. In addition, fibromyalgia patients are often subject to abnormally light a sleeping pattern which prevents the normal production of serotonin and growth hormone normally produced during stage 4 (deep) sleep. This inhibits the body’s ability to heal itself, and may contribute to the overwhelming fatigue and depression experienced by those with FMS.